Officials at Georgia Tech in Atlanta are warning students to be cautious after multiple encounters were reported between students and foxes, with one of the captured foxes testing positive for rabies. The incidents took place last week and over the weekend in an area behind the Molecular Science and Engineering (MOSE) building near the track and field facility, the school said in a statement. Three students encountered a fox on a pathway behind the MOSE building. Two of those students were injured in the encounter. The fox was captured and tested positive for rabies, the school said. (Georgia Tech) Georgia Tech is warning the campus community to avoid a sector of the campus where feral animals have taken up residence. A fourth student reported a run-in with another fox in the same area over the weekend. That fox has not yet been found, according to school officials. Georgia Tech student Abi Lewal told ABC affiliate WSB that she was taking steps to avoid any similar encounters while walking to class. "A friend of mine in my research group said he saw one of the foxes around here, so I decided to take the long way so we wouldn’t be accosted by whatever fox had made it here," Lewal told WSB. 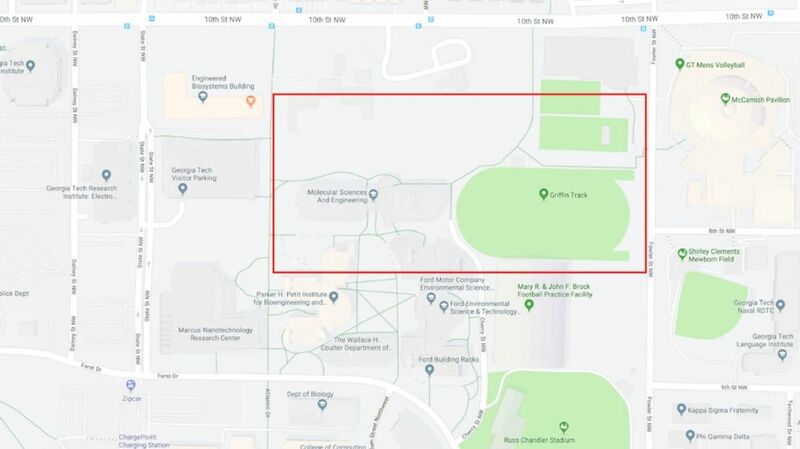 Officials said the students injured by the rabid fox were “receiving proper medical treatment.” They have advised students to avoid that area of campus. There is a possibility that “there may be several other foxes and each could carry rabies,” school officials wrote in a statement, adding that a field officer with the Georgia Department of Natural Resources would be involved in trying to find and remove the animals.